Glasgow City look certain to secure another Premier League title and a Champions League return after beating third-placed Celtic 2-0, with goals by Rachel Corsie and Emma Mitchell. Second-placed Hibernian's title chances took a hit when they lost to an Abbi Grant goal for Forfar Farmington. Spartans enjoyed a resounding 5-0 win at Aberdeen and six goals were shared in the mid-table match between Hutchison Vale and Hamilton. Inverness City and Rangers also won. The Highlanders thrashed Kilmarnock 8-0, while Cheryl Gallacher's goal for Rangers secured the points in a 1-0 win at Falkirk Ladies. 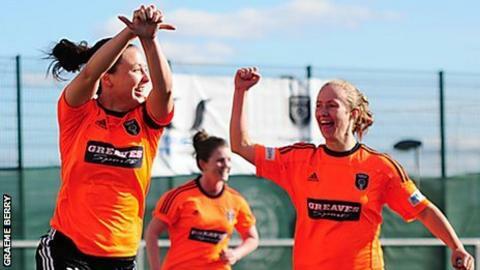 Glasgow City exited the Champions League earlier in the week with a 2-1 aggregate defeat by Fortuna Hjorring.